Natural botanicals like Coconut Oil, Grape Seed Oil, Organic Aloe Vera, Organic Sweet Almond Oil, Organic Shea Butter and Vitamin E combine to nourish and moisturize the skin, leaving it silky smooth, conditioned and soft. Pineapple and Lemon Peel extracts create a pleasant, light scent and further protect and soften. Great for the whole family! It just makes sense that your family’s body care products should be free of harmful chemicals. Especially since ingredients from products like lotions, which aren’t typically rinsed off, penetrate deep into the skin and body tissues. For dry, itchy, rough and scaly skin, you want the most natural, chemical-free product available. Soothe your skin and envelop it in moisture with the natural botanicals of our Body Lotion—a nourishing, conditioning formula that leaves your skin silky smooth and soft, with no harmful chemicals to penetrate the skin. After bath or shower, massage lotion over entire body. Use whenever skin feels dry. • Organic botanicals such as Shea Butter and Coconut, Sweet Almond and Soybean Oil infuse the skin with moisture. • Natural oils of Sweet Almond and fresh-picked Grapes quench thirsty skin with moisture. 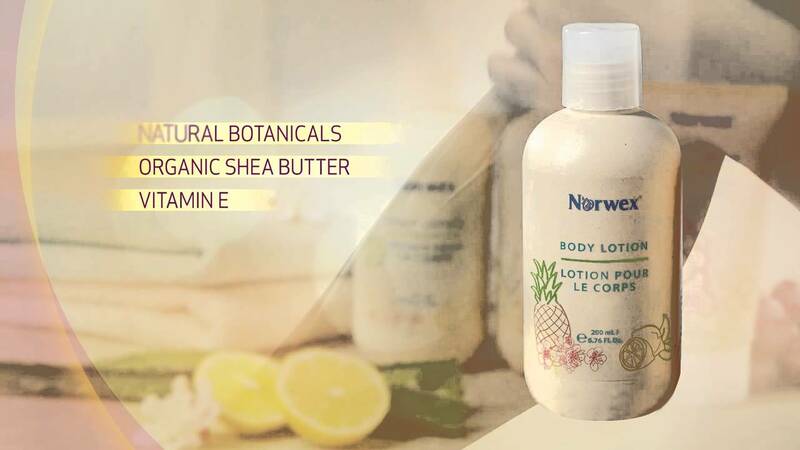 • Soothing Organic Aloe nourishes skin, leaving it silky smooth. • The antioxidant properties of Grape Seed Extract, Organic Sunflower Seed Oil and Vitamin E help protect skin from free radical damage. • Mild scent and gentle, natural formula make it ideal for the whole family. Body Lotion has been certified by two reputable agencies, BDIH and NATRUE. Dry skin is caused by the loss of water in the upper layer of the skin. Leaving a bit of moisture on your skin after showering can help prevent your skin from becoming dry. Lock in that moisture with Body Lotion.